Suicide is such a delicate subject, but I guess that's what we need to change. So we can actually just talk about it. Instead of getting awkward and tongue tied for fear of saying too much, or the wrong thing. Although I have experiences relating to suicide, it's still not something I can easily write about. But this World Suicide Prevention Day the theme is Reaching Out and Saving Lives. And I want to do my part. I've actually been thinking of starting a support group on facebook for my area, but I also want to volunteer for the Samaritans. And also Beat Bullying, an important cause to me. In some of my many leaflets and work sheets I picked up from my counselling sessions (a lot by the way, it seems I'll read anything) there were plans and tips for when you are feeling suicidal, and for a person helping them. I've actually only just remembered that I made a little emergency plan quite a lot of months ago, written on paper in green marker, stuffed away in a book. I think I threw it away when I didn't need it written down anymore. If you have ever had suicidal feelings, or to harm yourself in some way, it's just overwhelming, so much so I don't think I can explain it. It's not something that is easily explained, ya know, science doesn't fully know yet so how should we?! But if you ever have, you know what I mean. And if you still do, if you sometimes do, or if you do right now, you might want an emergency plan for when you need it. 1. Wait ten minutes. Then see if you can wait another ten minutes. Then maybe more. 2. Find Max, text, or call. If not another trusted person, preferably who lives nearby. (An extra tip from my mam, something she told me years ago, is to wear an elastic hairband around your wrist and ping it when you feel like harming yourself). Your emergency plan can go something along the lines of my one, with emergency contacts (who you should show this plan), emergency services and Samaritans or other local helpline. You might have other tried and tested techniques, or have heard of some to add to your plan, you could even share in the comments below. Write phone numbers for helplines directly onto your plan, and even for your emergency contact. Write it simply, make the plan of action actually contain actions, not 'think about how great life is' , but actual breathing techniques, numbers to call, people to sit with you, watch a twenty minute episode of something and then evaluate again. I have found directing trusted friends to good articles and official advice on how to help someone else (Mind: Helping someone else) a great way to have someone who knows what to do and how to take care of themselves. Joining a support group on facebook for bloggers with invisible illnesses has also been a great support and comfort. If you're not a blogger though, you might find one for your area, or for your university, or company. If you need someone to talk the The Samaritans have a 24 hour helpline, and you can also email if you don't need immediate help, something I have used in the past and found very helpful. 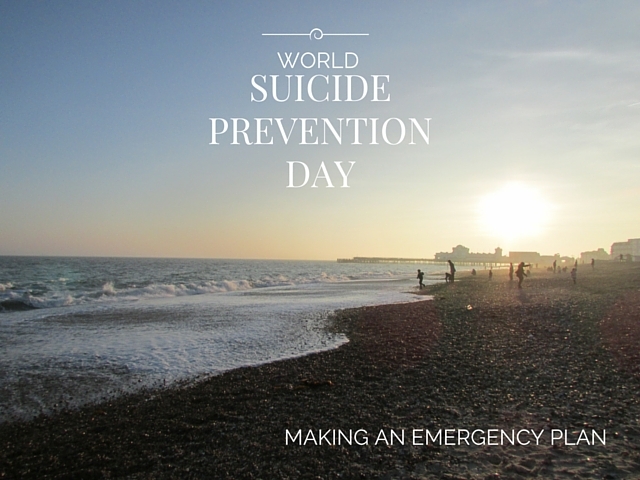 Here are some further links about World Suicide Day and Suicide Prevention.